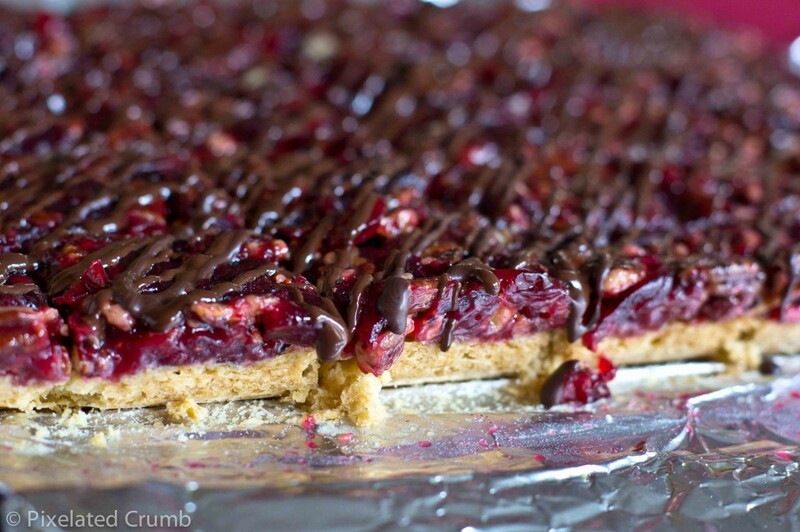 I was all set to make the cranberry crunch bars from Moosewood Desserts for a potluck at work, but then I saw these cranberry turtle bars on Beantown Baker and I just couldn’t get them out of my head. I had to make them. I was a little nervous about making caramel since I’m always terrified of burning caramel, but it’s really not hard at all and it’s even easier if you have a candy thermometer. I got all my ingredients and equipment ready and got cookin.’ And then I realized that my candy thermometer wasn’t a candy thermometer at all – it was a chocolate thermometer (for tempering chocolate) and only went up to 70 degrees F. I needed a thermometer to go up to 245 degrees F.
I ended up using our instant read thermometer, which I love and can’t recommend highly enough for things like meats, breads, and cooking custards, but it’s a little dicey with liquid that’s bubbling all over the place. It all worked out in the end, especially since when I told my mom about it, she went out and got me a really nice candy thermometer, so I’m all set for next time (thanks, Mom!). After all the unnecessary anxiety about the caramel, the turtle bars really aren’t as caramelly as I had expected them to be. Don’t get me wrong. They are fantastic, but I was expecting something a little different, i.e. a strong caramel flavor. 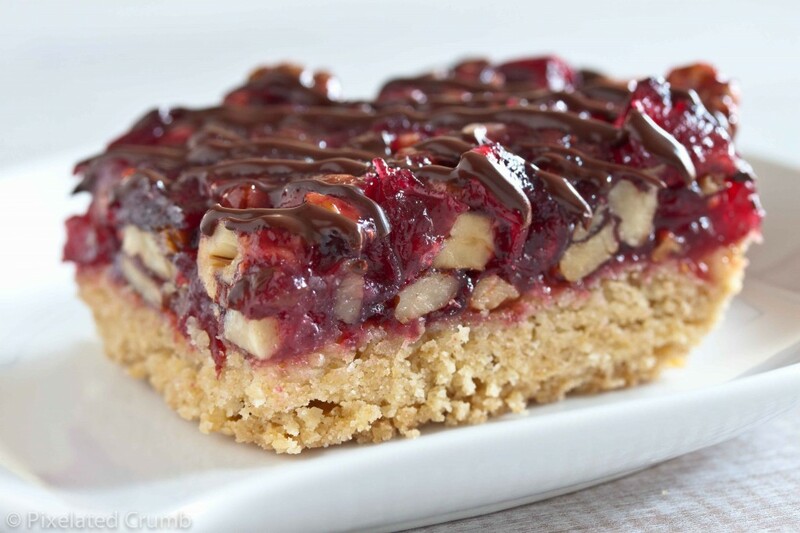 The cranberries are what really shine in these bars, with the tart berries complemented nicely by the caramel and of course the chocolate that’s drizzled on top. Plus, they’re beautiful bars – perfect for a holiday party! Chop the pecans and toast on the stovetop or in the oven. Set aside and allow to cool. Preheat oven to 350 degrees F and place a rack in the middle. Line a 9x13-inch baking pan with two crisscrossing sheets of foil, leaving a two-inch overhang on all sides. Butter or spray the sides (but not the bottom) of the foil with nonstick cooking spray. To make the base, blend flour, brown sugar, and salt in a food processor, then add butter and pulse until mixture forms pea-sized lumps. Pour into prepared pan and press down firmly all over with a metal spatula to form an even layer. Bake in middle of oven until golden and firm to the touch, 15 to 17 minutes, then cool in pan on a rack. While base is cooling, melt butter in a 3-quart heavy saucepan over moderate heat and stir in sugar, corn syrup, and salt. Boil over moderately high heat, stirring occasionally, until caramel registers 245 degrees Farenheit on a candy thermometer, about eight minutes. Carefully stir in the cranberries. The caramel will seize, but don't worry. Allow the caramel to melt back down, stirring, as necessary, to prevent burning. Boil until caramel returns to 245 degrees Farenheit. Remove from heat and stir in vanilla extract, then stir in pecans until well coated. Working quickly, spread caramel topping over base, using a fork to distribute the nuts and berries evenly. Cool completely. Lift bars in foil from pan and transfer to a cutting board. Cut into six vertical strips, then five horizontal strips to form 30 bars. Melt chocolate in top of a double boiler, stirring until smooth. Alternately, melt in the microwave, stopping to stir every 20 seconds. Transfer chocolate to piping bag or small heavy-duty sealable plastic bag. If using a sealable plastic bag, seal top and snip off a tiny piece of one corner to form a hole. Pipe chocolate decoratively over bars. Let stand at room temperature until chocolate sets, about one hour. 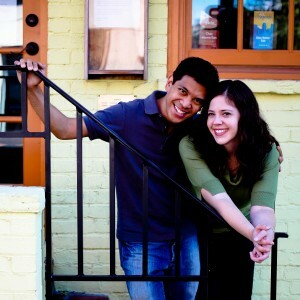 This entry was posted on Sunday, December 18th, 2011 at 9:26 pmand is filed under . You can follow any responses to this entry through the RSS 2.0 feed. You can leave a response, or trackback from your own site. I agree – these bars are beautiful and delicious, but I was also expecting a stronger caramel flavor. These look amazing!! 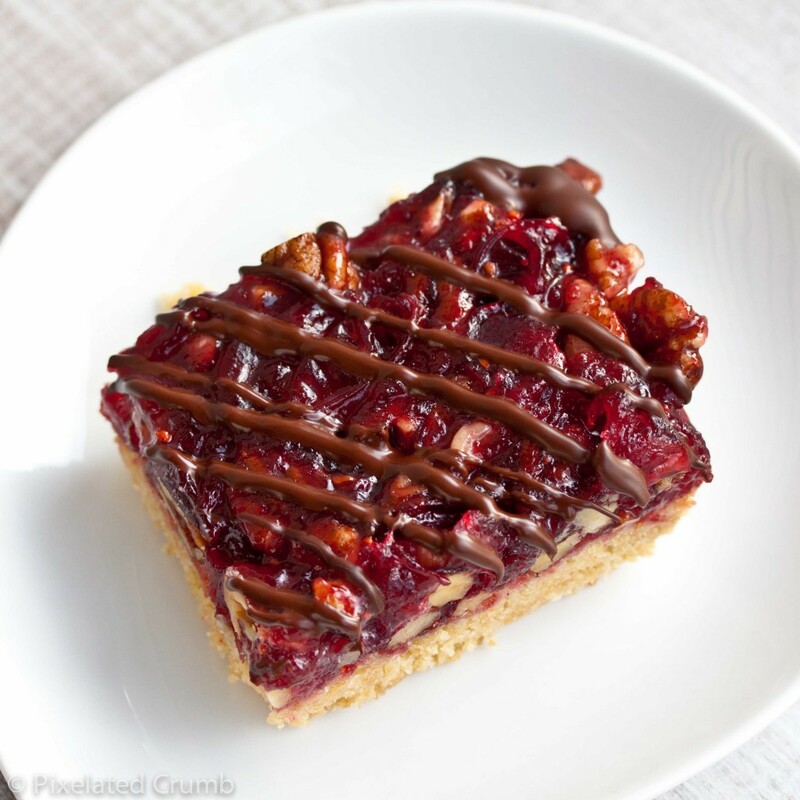 How do they compare to that cranberry upside down cake from last year? Ooo, that’s a good question! I love that cake so it’s really hard to hard to say which is better. They’re both pretty different, especially since these have the chocolate. 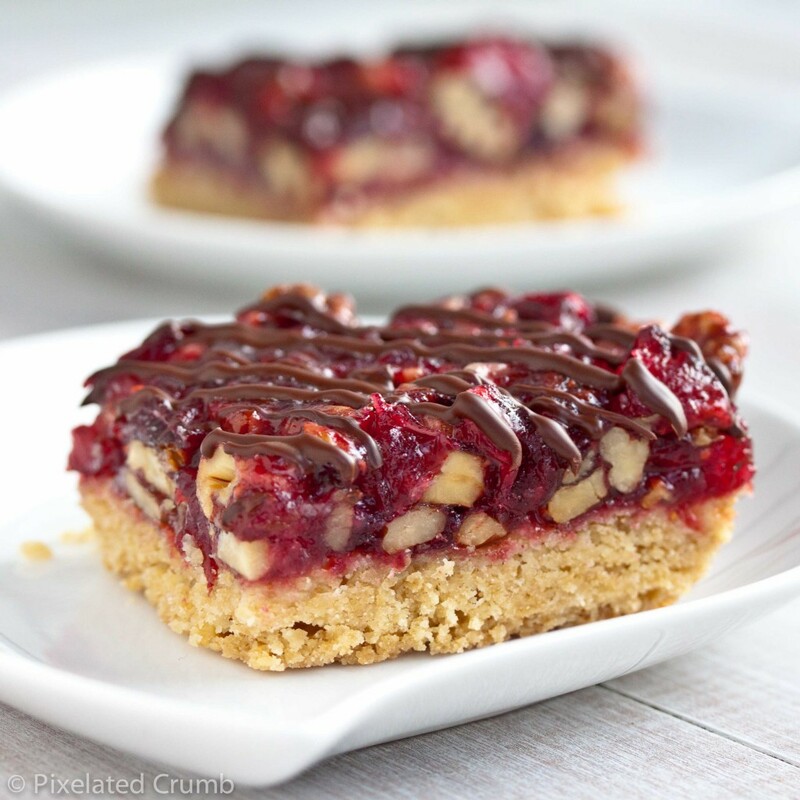 If if you’re after some intense cranberry flavor then maybe go with these bars. If you want something a little easier or less rich, go with the cake. Either way, you can’t go wrong! lovely pics, looks so christmas-ey & colourful! These look really delicious and so tempting! I will have to give these a try as cranberries are on sale at all stores! I just tried making these and they turned out great! Thanks for the recipe! !